The second Leeds Rhinos and Yorkshire Carnegie Fans Forum meeting of 2016 took place on Wednesday 27th July and the Forum members heard from guest speaker, Sam Horner. Sam Horner is one of the Leeds Rhinos Foundation Community Club Development Officers. 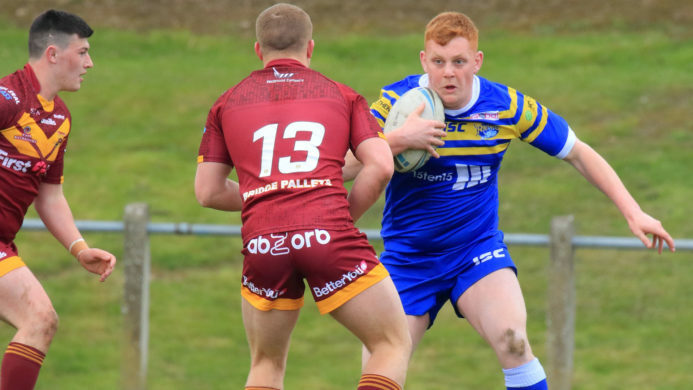 Sam is the main contact that joins the community clubs together with Leeds Rhinos. There were 25 initial clubs that were part of the scheme to start with which has grown to 35 that all take part in the Leeds Rhinos Ambassador Scheme. In addition to these clubs we have 24 ‘out of town clubs’ who have an engagement with us at points throughout the season. The scheme engages clubs in lots of ways through fundraising, coaching, development etc. Sam has always been involved with Rugby League throughout the years and even used to coach Jordan Tansey and Carl Ablett in their youth on a scholarship scheme. He then got the opportunity to coach the Leeds City College. He was then asked to come on board with Leeds Rhinos as a development officer when the RFL received funding for projects like the foundation. When funding for the Foundation got cut Sam was in a place where he could have lost his job. Gary Hetherington then saw the potential that Sam had and came forward to ask him to join the Foundation full time and he has been here ever since 9 years on. 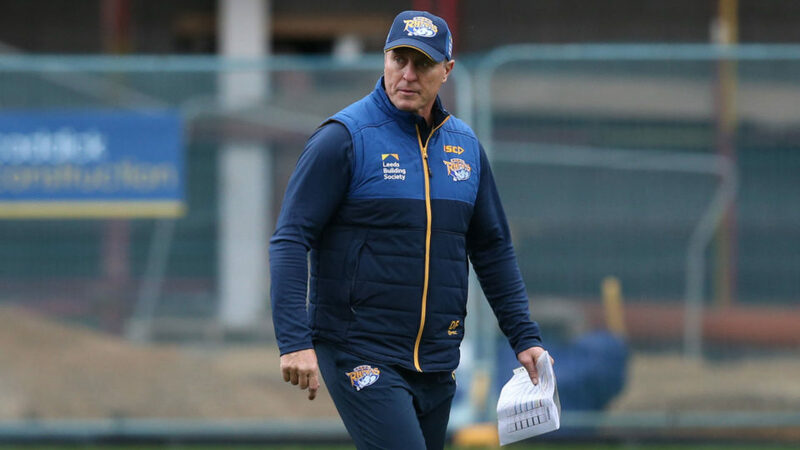 The Leeds Rhinos Foundation has gone from strength to strength and started with 5 members of staff covering everything from delivering coaching sessions to match day half time teams. Now the Foundation has 45+ staff working across all the different areas from dance workshops to multi skills sessions and The Rhinos Challenge in Skegness. Andrea: What ages do you work with? Sam: The foundation have just received five years of funding through SkyTry. This means we can go into schools and clubs and coach the younger groups of kids. We work with cluster schools for example Stanningley Rugby Club has a cluster of schools around it so we work with those schools and then they feed into the local clubs. In the schools we start with kids as young as Years 1&2. We coach them to certain levels for their age groups and then if the interest is still there they can sign upto Yorkshire Juniors. That is where the process begins. When you look at the kids in schools who want to play, they are your bloodline. They are the kids that you will see over the next ten years develop their skills and hopefully become successful. We also work with a range of ages in SILC (Specialist Inclusive Learning Centre) Schools. With those schools we hold a number of Tag Rugby festivals across the ages and all sorts of other development programmes. It’s about engagement in the community not just about rugby development. I play over 35’s rugby league so I should say I work with a huge age range of people. Sam Brightbart: Is it just males you work with? Sam: No. We have a Development Officer in the Foundation called Lois Forsell. She plays for England and Bradford Bulls. She is a great development officer not just a coach. She puts infrastructure in place and makes sure that the schemes are strong to deliver the best results. She has just organised a Rhinos Challenge that was held at Weetwood for the first time. Lots of female teams came even some from St Helens etc. She is a great ambassador for female rugby and it’s great that we have that in the foundation. Malcolm: Do you ever pick up late developers? professional manner to help them to develop both as a person and a player. Malcolm: Is it hard to keep hold of them against other clubs? Sam: You do get other clubs coming round and trying to scout kids that you have been developing. The clubs offer the kids and their families a corporate trip to games and get them hooked in. We pride ourselves at Leeds with the pool of local talent that we have. You just have to look at the Golden Generation that we had. A lot of them like Danny McGuire, Jamie Jones-Buchannen etc. are just some of the guys that came through. Gerry: How do you evaluate how successful you’ve been? Sam: The best way to look at it is looking at how long you are holding onto the kids. You will lose some through the system. It’s a tough game. It is not for some kids as they don’t seem to be able to make the next step. It’s not just about being hard it’s about being dedicated. You have a great pool of kids coming through the system. I coached Paul McShane and at 12 I knew he would make it. David: I coached at East Leeds and you can always spot the kids you know that are going to make it, even at amateur level. Even the ones that don’t make it as players you see them develop and become refs and still go watch the teams. Surely part of the development is developing the interest in the sport. Sam: We have a programme called Ref with the Rhinos. We did have one kid called Nathan who was at Kippax. He came onto the programme and he is now a referee. We also have some girl referee’s. As you look at development as a foundation we don’t just do this in sport we develop them in other areas too. Jon: Have you got anyone at the moment that you see potential in? Sam: I’m not in the scouting system anymore but we do track kids as I mentioned previously so I do keep a look out. There are definitely 5 or 6 kids in the Under 13’s to keep an eye on. Ian: We have heard from other guests previously that you cannot tell which code the kids will play until they are about 17. What are your thoughts? games. When you look at the players there isn’t much difference but the game is. Rob Burrow for example typifies a rugby league player. Jason Davidson, Head of Athletic Performance, knocks out players that can play a full 80 minutes. They are stripped down because they aren’t massive guys. They have great fitness and agility. When you look at rugby union it is a different fitness as it is the difference in the way of the engine. The conditioning process is different. Not taking away from union at all as I say this you just need different skill sets. Susie: What age do you think you see where they will play? Sam: I would say around 15 myself. I think the kid knows themselves where they want to end up. Sian: You had a bit of involvement in the re-engagement programme. Can you tell us a bit about that? Sam: The scheme was Re-Engage with the Rhinos. This is a scheme that brings in mis-understood kids who maybe don’t succeed within a main stream school with the environment. The re-engage programme brings in kids to look at different ways in setting goals, looks at media programmes, get them involved in playing sports, outdoor activities etc. The programme was based on truancy at school. They had to attend a certain amount of days to warrant getting to come and work with us. We weren’t demanding things from the kids but we were setting them targets and goals to work towards. We worked them both mentally and physically to get the best from them. I was born at the side of a prison in a back to back house. It isn’t about what you have in life it is about finding interests and setting goals for yourself to achieve in life. That’s what we aim to do with the programme. Changing lives through sport is our strapline. 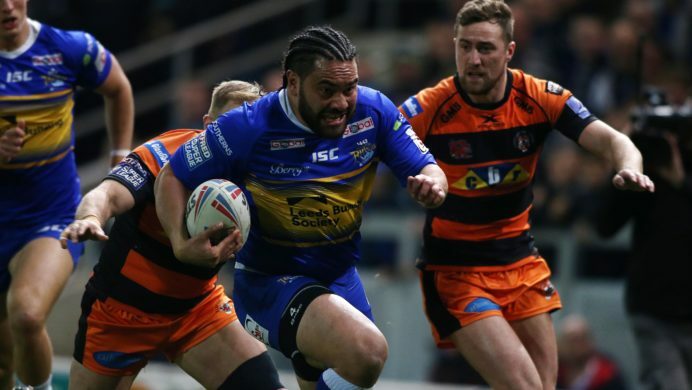 Sian: Sam is really the glue between the community clubs and the Rhinos. The direct communication at one time between the club and the community clubs wasn’t brilliant and Sam has worked hard to bridge that gap and build relationships. Sam: As a coach it would be my dream to see some of my kids make it in the professional game. But what we need to do is retain players. We have a good rapport with the clubs now but we always want to make sure that we have a good support mechanism in place so when those kids move on a level or drop out there are things in place to replace them. There is a massive drop off at 14 where kids drop off and don’t go back to their clubs. We need that support in place looking at when the drop off happens as it is huge at the moment. Ian: Are you involved with the universities like what they do in rugby union? Parker, we then have our School Development Officer, Richard Tate, who actually coaches the Leeds Trinity University rugby league squad Titans. He has also just been to Hungary with the GB Pioneers Student Rugby League National Team. So we have great links with the universities etc. in the city and county. Angela: I have put my hand up to volunteer a number of times with the foundation but not really heard much back. Sam: We are looking into a Volunteer with the Rhinos programme. I want to look and engage all age groups and get people in who want to help and be a part of the club activity. Maybe you can help with that scheme and setting it up. Sian: I am sure you can all agree Sam is a great asset to the club and that is only a small amount of information on what the Foundation do within the community. Thank you for coming Sam it has been a pleasure. Sam: One final thing, there is only one winner, and that winner is rugby!! We thought the pre match entertainment before the Wigan game was great. Loads going on, Lizzie Jones and Opera Man were great and you just can't beat some guys parachuting onto the field before kick off! I personally got great service from the staff in the shop the other day- I changed my season ticket and was personally taken to the seats to view my options before buying. Really good. When will new kits be coming out – we thought the players looked smart in the black strip against Wigan? Why aren’t all player recruitments announced? This year according to the player’s former clubs site Warren Seals has signed for Carnegie but there has been no official announcement to date. Sian: There has been no confirmation to the club of this signing being made. When there is a confirmation of any signings we will publish these online and make the announcements. Why no news on "forgotten" players such as Fred Burdon and James Fitzpatrick? Sian: Fred was out of contract so he could leave the club. James went in the middle of the 2015-2016 season. He has signed for Newcastle Thunder and transferred to rugby league. Have ideas been formed in terms of time to be given to becoming serious promotion contenders? Sian: All these topics are covered in board meetings. The notes a documented and published twice a year. The Leeds Rugby Fans Forum is designed to deal with off the pitch matters only. What is latest on ground development plans along with related housing development of two sites to assist funding of scheme? Sian: This is all at planning permission stage and we do not have any updates thus far. When will on-the -road venues and dates be released? Sian: We will be going out to the Yorkshire clubs to offer them the fixtures and we are currently waiting on feedback from these clubs. We are in talks with Adam Blades (Community Manager) and Andy Rock (Academy Director) to find out who the best connections are to speak with about this. The fixtures will be released when we have them finalised. Have plans been put in place to address last season’s disciplinary and inconsistency issues? 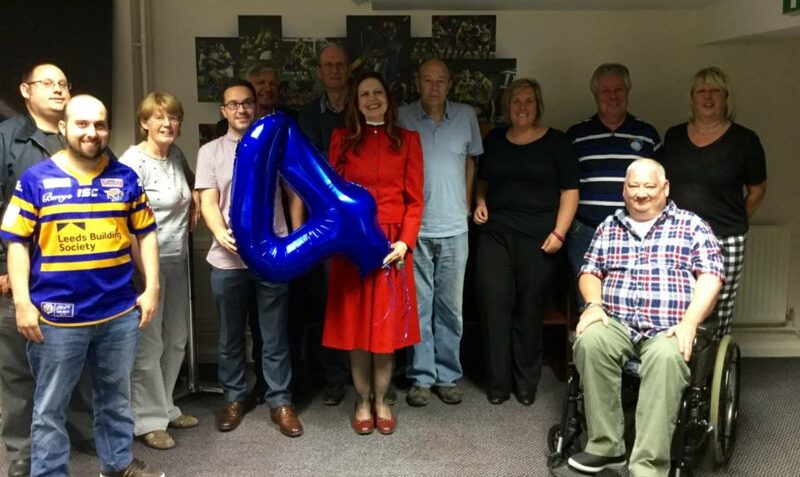 Sian: The Leeds Rugby Fans Forum is designed to deal with off the pitch matters only. ames that are close by (starting at the friendly against Wasps) I will probably keep myself to London reading etc couple of hours’ journey away. My question is why does the club not provide a cut down membership for people like me, sell me away tickets and make a profit (Wasps is an £11 ticket I would have paid £20 if it had come from the club with some form of membership). Think of it as an away fan club, monthly newsletter, membership card etc and allow me to " join the club"
discounted tickets which is very unlikely. Can anybody enlighten me why there are gold member’s events but none for the Rhinos 4 Life. We pay money every month on top of a season ticket and all we get is a pass to long bar and a bit of discount. 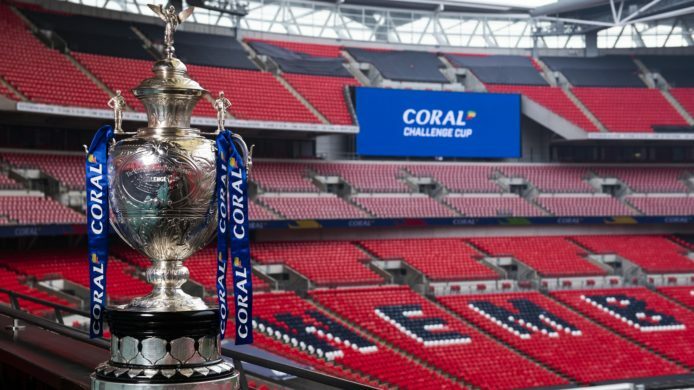 Sian: The Rhinos 4 Life option is not the same as the Gold Option as this is the club lottery scheme which as it is a part of the club carries a small number of additional benefits such as the shop discount and access to the post-match players’ lounge after every match. This is separate from Rhinos membership however we do provide a couple of benefits that link to the Rhinos. 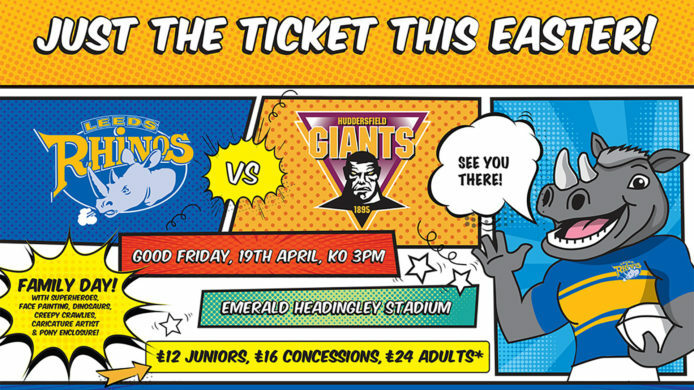 I purchased a Rhinos Silver Membership for the first time for the current (2016) season. As Membership is up for renewal I have referred to the "Benefits" available for members. Bullet point no 2 states " New for 2016, Exclusive Invitation to Members Only Retail Events….exclusive discounts…. notified via e mail …. I have no recollection of receiving an e mail or viewing any information on the club website regarding these exclusive events. Maybe in future SMS messages could be sent out to members? Sian: Thanks for the feedback Richard – we have only had one this season so far and we are due another one before the end of the season so I will pass this onto our communications team regarding the SMS. Sian: The decision has been made to make the stand approximately one quarter seating and approximately three quarters standing. The approximate numbers (which vary during construction) will be 2000 seating and 5000 standing. Works will be managed utilising specialists to endeavour to maintain the atmosphere generated by the current South Stand structure as best as we possibly can. Sian: Thanks for the feedback. I will pass it on for future discussions about when matches are but it is unlikely to amend. Thanks for your email. I’m sorry to hear you have not upgraded to Gold for the 2017 season. I appreciate your feedback on the Gold Members bar which is now in the Long Bar. We have done a number of things to improve the experience in the Long Bar, including the use of Rugby AM’s Alex Simmons to host and provide entertainment. We also aim to provide much more content with interviews with current and past players and other local personalities as well as competitions to win prizes. I understand your complaint about the coffee and food and I’ll feed that one back to see if we can improve the offering. I’d also point out that Gold Members get other great benefits including a gift pack featuring a Review of the Season and other great gifts. They also get an invitation to a Meet the Players Event every year. If you do change your mind you can upgrade £25 which works out at less than £1.79 per home league game. I have recently renewed my season ticket for the South Stand on the western terrace. In view of the lack of cover, and the fact that the ticket price has not reduced, would it not be a good gesture, and a good means of marketing the club, by offering something like a plastic poncho for all season ticket holders on the western terrace for 2017. Especially for those who have moved whilst the South Stand is being rebuilt?